Bicycle booms made by environmentally friendly vehicles or health-conscious people in recent years are centered on ornate road bikes, and they are used for the Velodrome such as the Tokyo Olympic Games in 2020 Izu Velodrome, which is a Paralympic cycling track event venue and various locations throughout the country The track cycling that is held at the velodrome can not deny the feeling of missing the boom. The image of Roadi 's holdings for short distance events such as time trial (man's 1 km, woman's 500 m) among track cycling competitions, will be a practicing scene that was destroyed by stoics to shorten a few seconds. 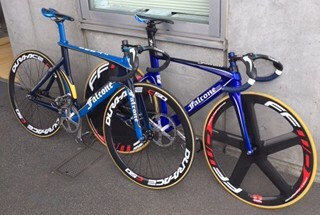 We usually practice at the municipal Hakodate velodrome, but it is not a special existence. Like Roddi's people, We love cycling, fighting the wind, feeling the speed limit, pedaling all the way toward the goal line, and after practice bicycle talks bloom the cyclist group. Bike enthusiasts may feel that the race track and the bank of the bicycle stadium are dangerous and the familiarity of the threshold is also thin. It is true that the 400 meter runway of the Hakodate velodrome is a sacred place where professional Keirin Racer compete at the risk of life but if we join our colleagues and practice them seriously keeping moderation the slope of Hakodate velodrome 30 ° 36 ' The bank of 51 "can be the best situation as a place of self-challenge.If you are interested or interested, please contact us once. Copyright(C) 8823Falcone Track Cycling All Rights Reserved.